Despite reports claiming family kicked out Hamas from mourner's tent, video proves they greeted armed terrorists with kisses and joy. Masked and armed Hamas terrorists were received with ululations of joy at the mourners tent set up for terrorist Abd al-Hamid Abu Srour, 19, who last Monday conducted a bus bombing in southeastern Jerusalem in which he died while wounding 15 victims. Video of the terrorists' warm welcome can be viewed by clicking the image below. While reports claimed the terrorist's family kicked out Hamas activists who arrived at the mourner's tent in Al-Aida adjacent to Bethlehem in Judea, video cited by Israel Hayom that was filmed at the event and spread online on Palestinian social networks shows exactly the opposite was true. Armed and masked Hamas terrorists are seen in the video entering the mourner's tent, only to be welcomed by the family with kisses and ululations of joy. The terrorists kiss Abu Srour's mother on the head and are met with cries of joy. The family's open support of the terrorist may not be that surprising given that Abu Srour was himself a Hamas member, and Hamas claimed responsibility for the attack. A family member of the bomber, Nasser Abu Srour, is currently serving a life sentence for murder. Back in 1993 the terrorist murdered his Israeli Security Agency (ISA) handler Chaim Nahmani, and later from jail he warned that there would be more intifada terror wars. In Palestinian media family members and acquaintances of the bus bomber expressed their support for the attack, and even said the infamous Hamas bomb maker Yahya Ayyash, known as "the engineer," was the person who Abu Srour most admired. 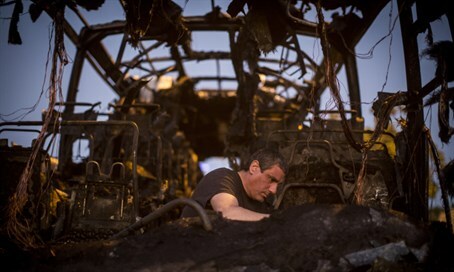 The bus bomber's father said that a day before the attack, his son disappeared and after the family reported his disappeared to the Palestinian police, ISA investigators arrived at the family's home and took the father to Shaare Tzedek Hospital in Jerusalem where he identified the individual who was critically wounded in the bombing as his son. Abu Srour later died of his wounds, which he received as the bomb packed with nails that was at his feet as he sat at the back of the bus apparently detonated prematurely. Six wounded victims from the attack on the Egged number 12 bus line remain hospitalized in the capital. Hadassah Ein Kerem Hospital is treating four victims, three of them in the emergency care ward where they are on artificial respiration and put to sleep on anesthetics, with their condition classified as moderately to seriously wounded. A fourth victim in moderate condition who is conscious is being treated in the plastic surgery department. Two other victims in light to moderate condition are being treated at Shaare Tzedek Hospital. In a moving gesture, Argentine pop star Lali Esposito sent a video message to 15-year-old Eden Dadon who was seriously wounded in the attack and currently is under anesthetics at Hadassah Ein Kerem. Dadon had her heart set on seeing Esposito perform in Israel this week, before the attack robbed her of the opportunity and nearly robbed her of her life.